Call 800-298-8924 to order Hopkins accessories and parts part number HM20014 or order online at etrailer.com. Free expert support on all Hopkins products. 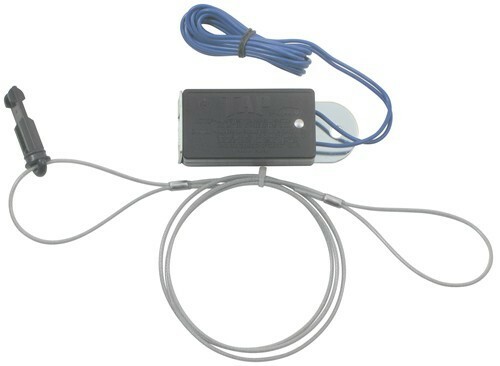 Guaranteed Lowest Price and Fastest Shipping for Hopkins Replacement Break-Away Switch, 44" Lead Wires. Accessories and Parts reviews from real customers. Replacement Safety Cable for Demco Hydraulic Brake Actuator - 28"
Today we're going to be taking a look at the Hopkins Replacement Breakaway switch. Now, a breakaway switch is designed to apply power to the trailer brakes to stop a trailer should it become disconnected from the tow vehicle. If the trailer and vehicle disconnect, the vehicle will pull on this cable, which would pull this pin out of the switch. Once that happens, the trailer brakes are applied to the trailer, and that's going to help bring the trailer to an eventual stop. The kit's going to come with the switch, it's going to come with your wiring, it's coming to come with the pin and the cable. Now, the wire leads, these are going to measure 44 inches long. One gets connected to power, the other gets connected to the electric trailer brakes. The cable right here, this is going to measure 48 inches, or 4 feet long. This is a high string steel cable that's covered with a protective coating to keep it from fraying and to keep it from scratching anything that it comes into contact with. The end with the pin gets connected to the switch. The other end is going to get connected to the tow vehicle. Now when it comes to the measurements of the switch, overall length including the bracket, that's going to give us a measurement of about 3 1/8 of an inch. Just the body of the switch is about 2 1/8 of an inch. The overall width is going to be about an inch and a half, and then the overall height is going to be about 1 inch tall. The diameter here of the mount hole, that's going to measure about 1/4 of an inch in diameter, and the hardware to get this installed is not included, so that will need to be provided separately. That's going to do it for today's look at the Hopkins Replacement Breakaway Switch. Thanks Ken s. for a great review and rating!! Hopkins appreciates your business. Thanks George P. for reviewing the Break-Away Switch!! Hopkins appreciates your business. Thanks for rating and writing a review! We are pleased that you had no issues with the HM20014. Thanks for the great review and comments, Rent a Gardner !!! We agree that the etrailer.com service is excellent. If you needed only the Switch Pin for your SMI Stay-IN-Play Duo supplemental braking system # SM99251 you could use part # SM99905. But for a complete replacement breakaway switch you can use any of the kits we offer, shown on the linked page. Since these all function the same way they are not brand- or system-specific. Examples of suitable items are # HM20014 and # FA80-00-2040. These and all others are shown on the linked page. The Hopkins Replacement Break-Away Switch, Item # HM20014, will work for you. Break-away switches are pretty universal in their design and function. The lead wires measure 44 inches. I have attached some additional information and a video to assist you with your replacement project. The replacement breakaway switch for the SMI Stay-IN-Play DUO Supplemental Braking System part # SM99251 is the Replacement Breakaway Switch Pin for SMI Supplemental Braking Systems part # SM99905. Yes, a breakaway switch only completes a circuit when the plunger is pulled. You can wire either of your trailer wires to either of the wires of the # HM20014 and it would work great. I attached an FAQ article on breakaway systems for you to check out as well. Most of the breakaway switches from ESCO are part number LBS48-16. We do not carry any of the components for that switch. If you are looking for a replacement switch the Hopkins Replacement Break-Away Switch # HM20014 would work well for you. Since switches are basically universal, this will work. I have attached links to a couple helpful articles about breakaway switches you can check out. Do You Carry the Pin for Engager BrakeAway Kits / Systems? We do carry replacement pins for the Engager Trailer Breakaway Systems. 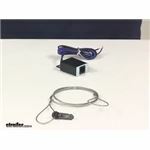 Item HM20010 has 7inches lead wires, and item number HM20014 has 44 inches lead wires. I will link you to both items below. If you cannot push the plunger back into the break-away switch, you may need a replacement switch like the Hopkins # HM20014. These switches are universal between manufacturers so this will work on whatever system you currently have. The brakes on your trailer will release when inserting the pin back in. You can try backing the trailer up just a bit to see if you can release the brakes and try inserting the plunger again. We do have a nice selection of replacement breakaway switches available that do not include the battery charger, such as the Hopkins Replacement Break-Away Switch # HM20014. 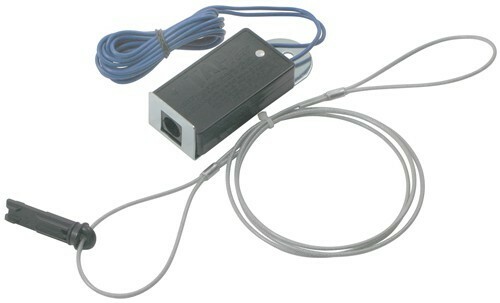 This particular switch includes lead wires that measure 44 inches in length. For a replacement cable and pin, you can use # HM20051. I have attached a link that will take you to our available selection of replacement breakaway switches that you can also look through. Without knowing the brand of your break-away system, I can't just give you the plunger part number. If you know your brand you can simply replace the pin with a new one. I recommend the Hopkins Replacement Break-Away Switch, 44" Lead Wires # HM20014 which can be used with any break-away system. A breakaway switch is a very basic device so you can use switch # HM20014 with your braking system. But I recently learned that the BrakeBuddy switches use banana clips to connect to the BrakeBuddy itself. To use this switch you would need to obtain those clips from an electrical supply store. I recommend using the Hopkins Breakaway Switch # HM20014 for your BrakeBuddy Vantage 39504. Breakaway switches are pretty universal so this will work well for your application. Please note that your Vantage uses banana clips to connect the switch to the unit itself. If you need to replace those as well then you should be able to find these at your local electrical supply store.